Updated entry-level line of instruments boasts new pickups and finishes and enhanced electronics. Signature model is a reproduction of Strokes guitarist's 1985 reissue of a ‘72 Strat. 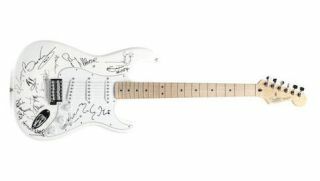 On the tenth anniversary of Sept. 11, 2001, the Fender Custom Shop offers a tribute to the fallen in the form of three custom Stratocaster guitars.